Another year, another beach sand sculpture! We recently returned from our annual visit to Maine. My son and his girlfriend joined us for the weekend, and helped build the annual beach sand sculpture! We are not sophisticated sand sculptors; we bring a couple of shovels and try to do something large and silly. That's it! Last year, my son wasn't feeling well, and without his help, the project was a big flop. We needed to redeem ourselves this year! So we built this rather large silly fish named Gladys. As you can see in the photo below, she had a barrier moat surrounding her, which protected her from the incoming tide. My son, his girlfriend, and my husband did all the digging, while I took a walk on the beach (and found kelp for her lips!). Then, when the pile of sand was big enough, I began the structure. My son and girlfriend helped a lot at this point, too,especially in shaping they eyes and tail, and cleaning the area around her. It is definitely a collaborative effort each year! When we left the beach, some kids were climbing on it. I was sure between the kids and the tide, there would be nothing left the next day. We did return the next day, and the moat was gone, the logs had moved, but there was still a large pile of sand, where kids played throughout the day!! I have other photos from the trip to Maine I'd love to share, but I'll save them for another post! If you'd like to see some prior beach sculptures, check out these posts from 2014, from 2013, from 2012, and from 2011. And here we are, below, the whole low-tech beach sculpture team! Hello loyal blog readers! 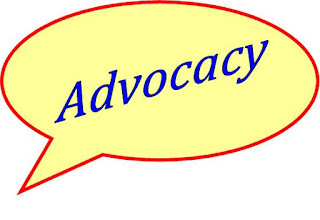 I want to take a moment to introduce you to a brand-new blog, The Artful Advocate. I'm currently serving on an advocacy committee for my state art education association, and, as the only experienced blogger on the committee, I offered to develop a blog offering tips and ideas about advocacy, to help art educators! 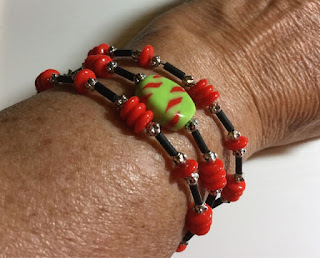 The blog entered the blogosphere just yesterday. I hope you'll be able to find lots of useful ideas and resources on this blog. 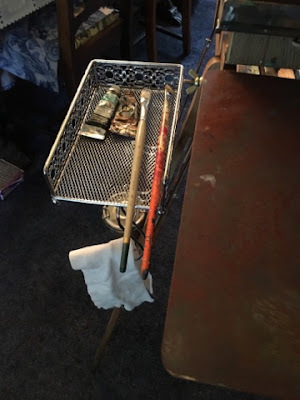 That doesn't mean you'll be seeing less of There's a Dragon in my Art Room; this blog will remain my favorite place to share lesson ideas, art projects, opinions on topics of art education, and my personal artistic pursuits with you, my readers. The new blog is serving an entirely different, but equally important purpose. 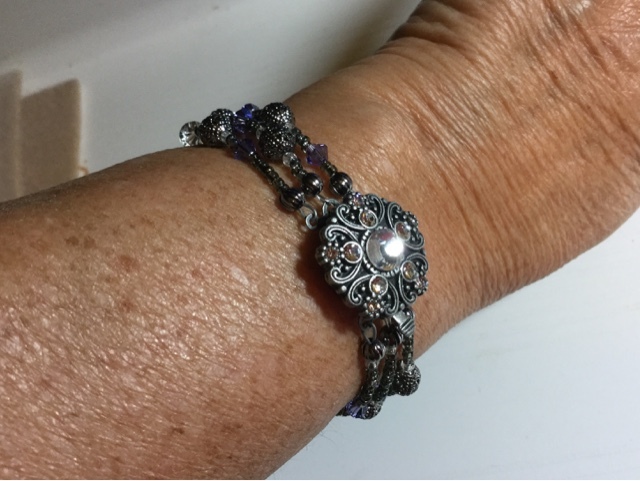 I hope you'll stop in and visit often, follow, and add the new blog to your reader! Thanks!! I've been slow about blogging, distracted by the summer. 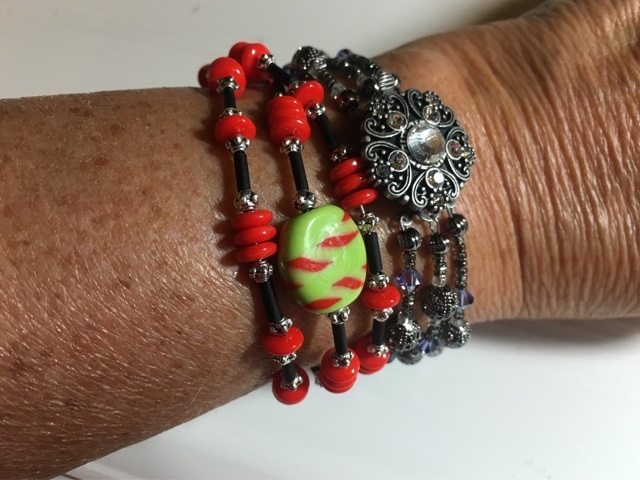 But it has been a few creative days, and I thought I'd share my creations! 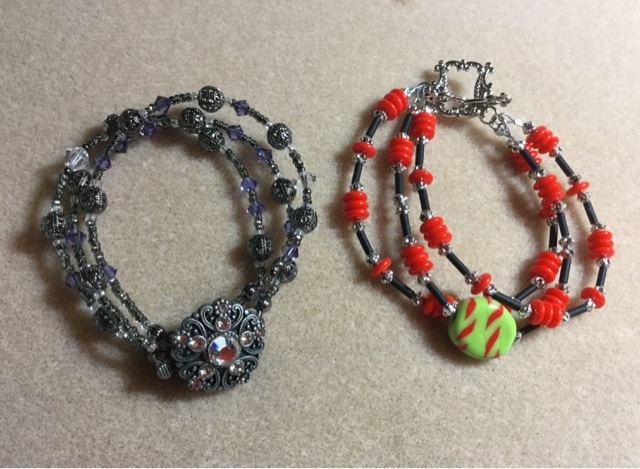 While watching the Olympics on TV, I made these two bracelets using beads from my personal stash. I decided to replace the faded curtains in our Adirondack lakeside camp, for the first time in almost 20 years! Last week I sewed and hung new kitchen curtains, and today we put up new bathroom curtains that I finished sewing yesterday. The next big job is the living/dining room, but there's a LOT of windows so that might just be a project for the winter. 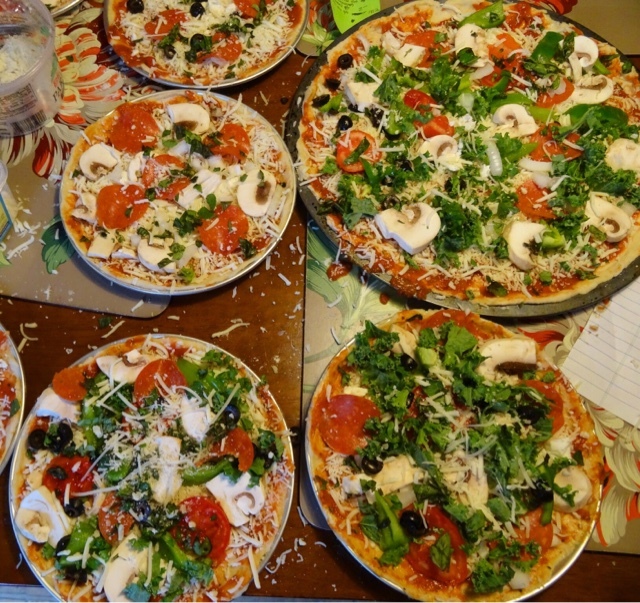 And my 10-year old step-grandson came over for the afternoon, and we made thin crust personal-size pan pizzas to order for everyone (including his mom, dad, and brother, plus my husband and me), using herbs, kale, tomatoes and green peppers from my husband's backyard garden, as well as other toppings. Here they are, straight out of the oven. They were as delicious as they look! Being creative isn't always doing a drawing or painting. 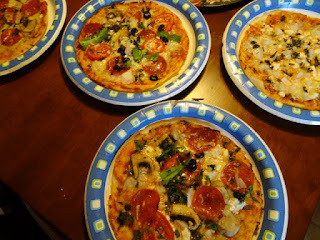 A pizza can be creative too!! Today I became an inventor. I needed a place to put brushes and tubes of paint that were in use while I'm painting. Above, you can see my stroke of genius, that I"ll be explaining in this post. To avoid spending an exorbitant $40 to buy something that wasn't exactly what I wanted anyhow, I went shopping and explored for alternate options and came home with some ideas. 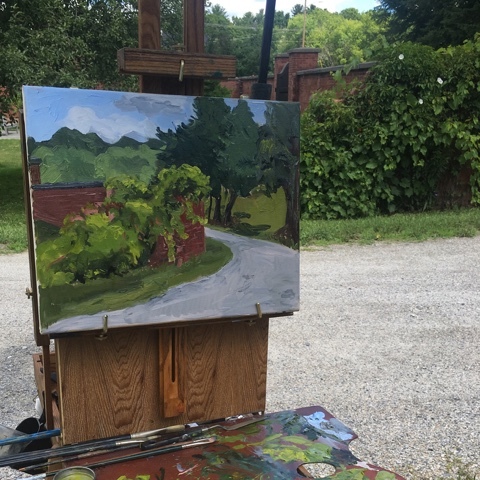 In this pic above, that I shared in my previous post about my plein air painting class, you can see I've got my paintbrushes plopped right on my palette. 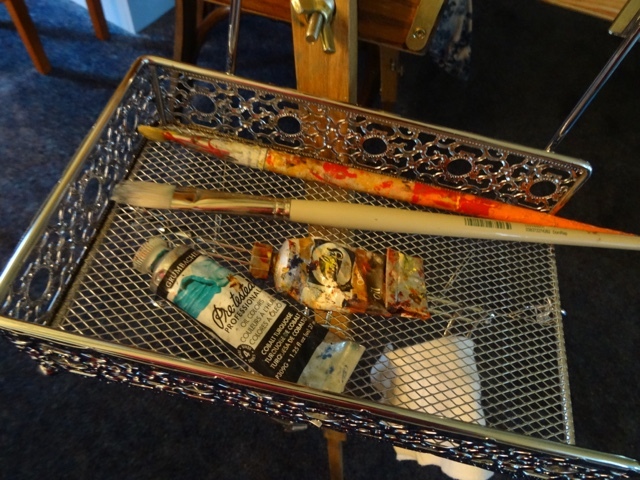 There's also some tubes of paint that can't be seen in the photo, also plopped onto the palette. As a result, I would pick up a paintbrush to use and there would be oil paint all over the handles. And the next thing you'd know, there would be oil paint on not just my hands, but also my upper arms, my shirt, my elbows.... yeah, basically everywhere! Or the painty brushes would roll off my palette and drop onto my shoe or leg, spreading even more paint mess. I'm typically a messy artist to begin with, so this just made things worse. I needed a solution, and I needed it fast, and I came up with what you can see at the top of the post and below. 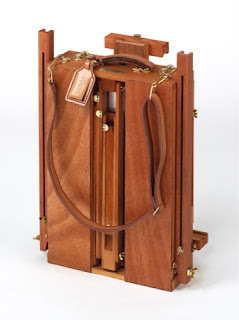 Let me explain about the easel, to better understand what I've invented. For plein air painting, I'm using a French easel. 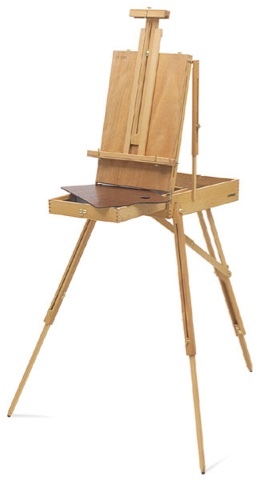 If you are unfamiliar with what a French easel is, it is a simple and fabulous invention. You start with a box that may weigh maybe 12-15 pounds (plus the weight of the stuff you put inside the box). The box has a carrying strap. It takes no more than 3 or 4 minutes to pop out the legs and get the easel standing. Inside the box, there is room for a whole bunch of paints, my metal medium cup, brushes, palette knives, drawing utensils, and a nice sized palette. Seriously!! 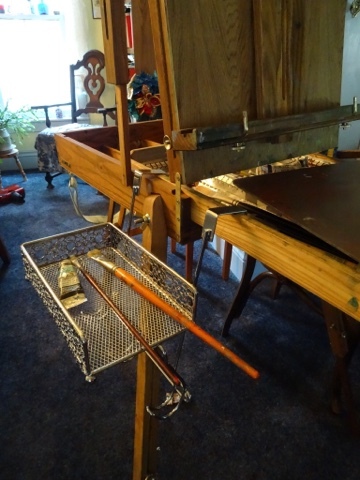 Here are pics of French easels, closed and opened. Searching online, I found contraptions of a few different types: little cups that clip onto the easel, and an aluminum clip-on shelf called "Shelf Help". I didn't like the cups, since I also wanted a place to put a tube of paint, and prices for the Shelf Help ranged from a low of $32 to close to $50. But it wasn't available for free shipping, and so the least expensive option, with shipping and tax, still came in at slightly over $40, for something that looked like a toaster oven pan with a notch cut out, and with a shelf bracket to support it. Not worth $40. So after looking unsuccessfully elsewhere, I ended up shopping at Tuesday Afternoon, where I found a closet door hanger for belts or hats, and a metal tray, open at one end, for "guest towels". I brought them home with my fingers crossed that something would work. The closet door hanger fit beautifully over the open drawer of the easel!! 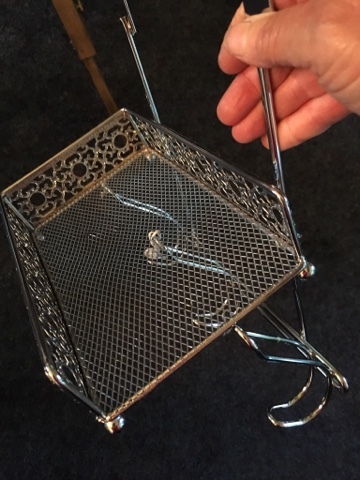 And then I used the packaging twist ties to hold the little open-ended basket on top of the hangers. And you know what? It seems PERFECT!! I can't wait to test it out "in the field" sometime during the next few days! And the best part? It cost me just $12, total! 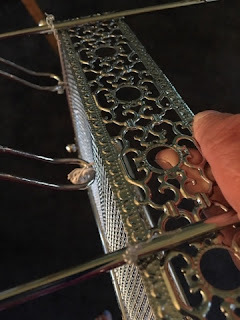 I may consider rigging some wire to form "cradles" to rest the brushes, so they don't bump into each other, but that seems easy. Or I may lay a piece of paper-toweling on the bottom to keep things clean. Either way, I'm totally thrilled that I no longer have to put my brushes right on the palette when it is loaded with paint. 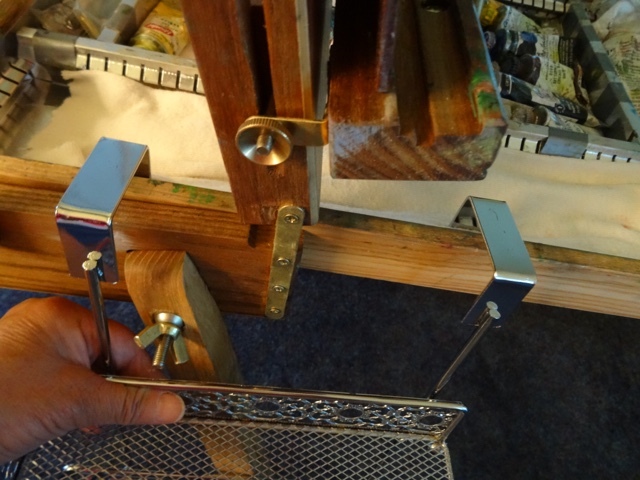 And the bonus is that below the little basket, there are three hooks (as you can see in the right-hand pic below) suitable for holding anything from a container of brush cleaner, to paint rags, or even my hat. By the way, I looked it up, and it appears that the phrase "necessity is the mother of invention" may have originated with Plato. Wherever the origin, the phrase made sense today, and I'm rather proud of my cute invention! !